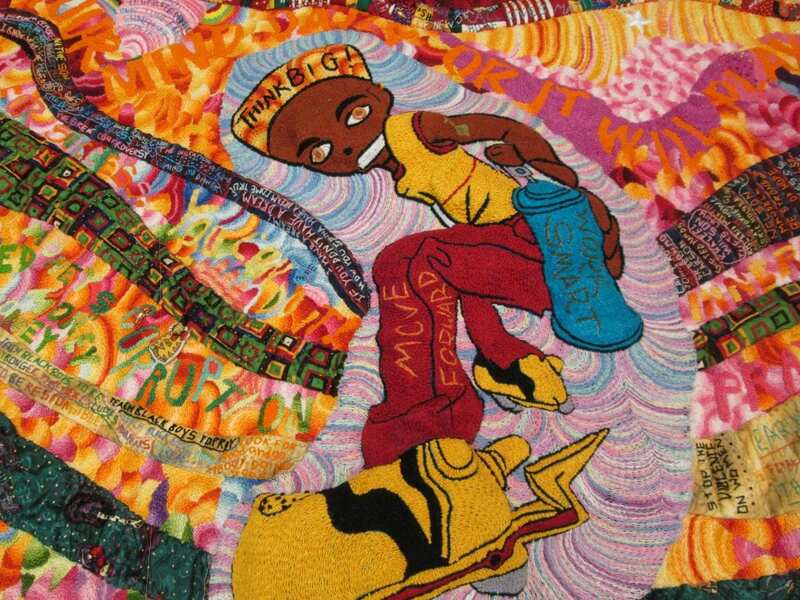 With our Form, Not Function: Quilt Art at the Carnegie exhibition currently on display in our galleries, we are delighted to present Joseph “Sunshine Joe” Mallard as our Lunch and Learn speaker for Tuesday, August 15, from 12:00 – 1:00 PM. For more than forty years Mallard has brought his intricate “tapestry-quilts” to community settings and workshops where he uses them to gently instruct his audience on the positive virtues of patience, perseverance, dedication, and hard work. 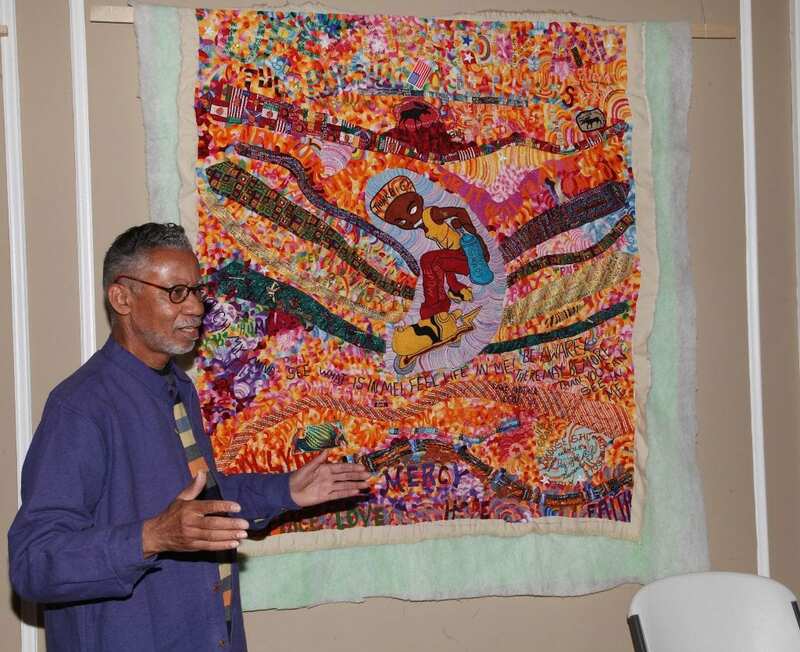 For our Lunch and Learn presentation Sunshine Joe will bring several examples of his rich textile art along with him which includes the many life stories that he references through thread on fabric. As a boy growing up in Summit, Mississippi, Joseph Mallard learned the art of stitching cloth together from his great, grandmother who was a former slave. 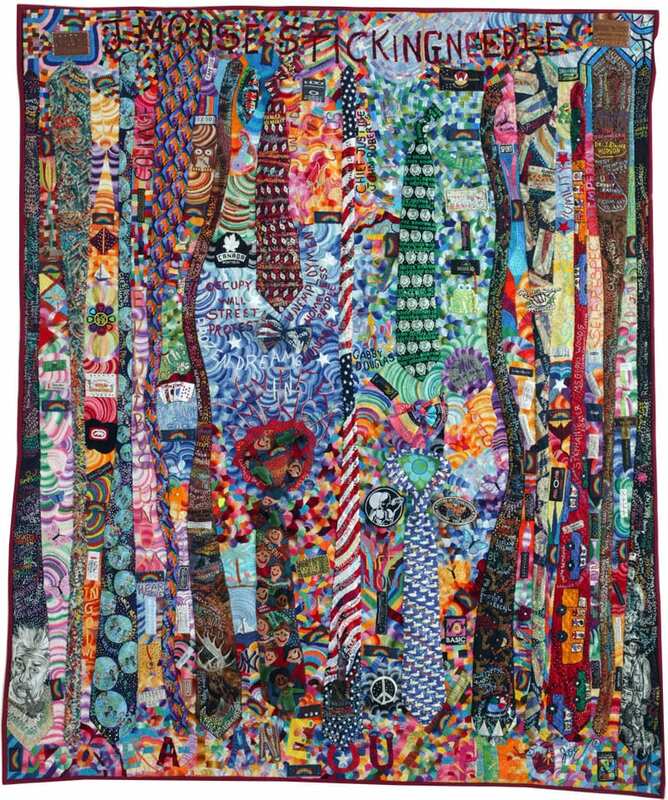 The artist learned stories about slavery while he visually absorbed her approach to quilt making which was bright, colorful, and made without a pattern. Later Mallard credits the example of Hall of Fame, professional football great, Rosie Greer, for helping popularize embroidery while also providing an example of a man working in a medium traditionally thought of as being the domain of women. “Sunshine Joe” Mallard’s first pieces were denim jackets he embroidered for his sons and over time, moved on to making more ambitious statements that often take years to complete. To commemorate President Barak Obama’s first term in office, Mallard created a work that chronicles 630 references to events both foreign and domestic that occurred during Obama’s first four years of his presidency. Other topics of social interest to Mallard include the challenges our youth face through poverty, hunger, and hopelessness. He earned the name “Sunshine Joe” from a group of fifth grade students with whom he was mentoring that remarked that he needed a nickname. The students said to Mallard, “…the sunshine brings light and you do too” and “Sunshine Joe” stuck from there. Mallard regularly exhibits his fiber art, but his work comes to life in a community or workshop setting. The artist has found a receptive audience and many teachable moments in classrooms, homeless shelters, senior citizens facilities, libraries, and community centers where his positive outlook on life and artwork are appreciated. Mallard’s art has found a niche and a reason for being beyond the role we often ascribe to art as a luxury commodity object or functionally useful article. Sunshine Joe’s work sparks dialogue and chronicles the hopes and challenges facing our greater community. We look forward to welcoming “Sunshine Joe” Mallard and the interested public to the Jane Barth Anderson Meeting Room on Tuesday, August 15. Lunch and Learn is a free to the public program, however, registration is requested if you wish to attend. Registering is easy and can be done by emailing Delesha Thomas at dthomas@carnegiecenter.org or by calling the Carnegie Center at (812) 944-7336. Come early, bring a lunch, and the center will supply beverages. Stay for the talk and check out our current exhibition afterward.